A six string harp from Gambia and Mali in West Africa. Traditionally a hunter's harp, this one was made by a relative of the master kora player, composer, and Griot Foday Musa Suso. 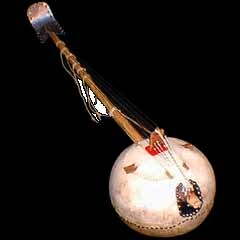 Sometimes these instruments are called dusongoni (spelled several ways - dousoun ngoni). Smaller versions with thinner strings are called kamele ngoni (or kamelen ngoni). The bottom photo is an electric version of this instrument made by Rich Goodhart. The sound sample is of the traditional version (photo on top).